This is a 4-part series which explains what Jamal Khashoggi represented ideologically, the relevance of his ideology in the modern Islamic World, the perhaps-unexpected similarity of his ideology with the Western World, and why – even more unexpectedly – the world is still talking about Khashoggi six weeks after his death. Why do so few remember Mehdi Ben Barka or care about Serena Shim even though they did far more for the People than Khashoggi ever did? There is a quick answer to this question: Khashoggi remains in the spotlight because the House of Saud killed a Western journalist. True journalist Serena Shim: As brave as they come. Despised by the empire and its vassals, of course. Her vital work cost her her life. One of the many victims of Erdogan’s treacheries and America’s endless criminal meddling in the Middle East. The location and details, or Khashoggi’s birthplace and background, are totally subservient to the fact that he worked for a top Western media and that he was blindly and foolishly loyal to their ideology. 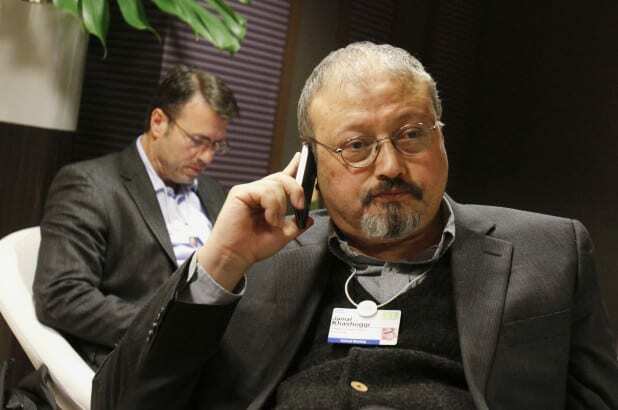 A Western journalist cannot be killed without media campaigns and even serious bilateral repercussions, but Khashoggi was no regular freelancer – he was a prominent editorialist at the United States’ 2nd-most important newspaper, the neoconservative The Washington Post. So, forget everything else: kill a member of The Washington Post and it is certain to be huge news for a long time…because they will ensure that it stays in the national headlines. Given that the US runs the Anglophone world, and add in that other Western nations (such as France) are constantly paying more attention to the US than their own backyards, and this all explains why the world is still talking about Khashoggi – if you think that the US isn’t the primary decider of what’s on the average screen, think again. That was the case with PressTV’s Serena Shim in 2014. She was born and raised in the US, half-Lebanese, a mother of two, and was doing ground-breaking, extremely brave reporting about Turkey’s collusion with Western NGOs to get terrorists across their border to Syria. She reported on PressTV about being threatened with assassination by the Turkish secret service two days before her suspicious death, and the West said…essentially nothing. Not their media, nor even the US government, even though Shim was a lifelong American citizen. Or what about Morocco’s Mehdi Ben Barka? It’s no exaggeration to say that he was the most widely influential Muslim thinker and activist of the 1950s and 1960s. Ben Barka was the organiser of the Tricontinental Conference in Havana, an update of the famed Bandung Conference, and the last great gathering of international leftism. We are in desperate need of another anti-imperialist conference, and another Ben Barka: he was the man who truly did bridge the gap between African, Asian and Latin American leftists, but he also could have done the same for the Muslim and European worlds. 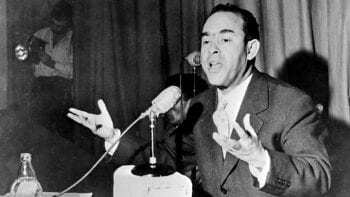 Just as East Asia had China, and then Korea, and then Vietnam, Ben Barka would have taken what happened in Algeria to Morocco – one of the few fundamentally key Muslim nations, historically – but he was abducted off Paris streets just before the start of the Tricontinental. Who killed him, why won’t France open up their archives, what is his legacy, why doesn’t Western media do more reports on the annual October demonstrations in Paris (and who is wiping my annual reports from Google and YouTube?!) to keep his flame alive in the public mind? To all that the West says…nothing. Both Shim and Ben Barka combine to disprove many unstated claims of the West: that they care about all journalists equally, that they care about Western journalists regardless of their political persuasion, that their presses are free, and that their leadership respects a free press more than in other nations. Ben Barka was the son of a policeman and a math teacher before he got involved in politics. Serena Shim had chosen a career in journalism, but hardly a ladder-climbing one – working for Iranian government media would only land you a job in a top Western media if you then turned around and denounced Iran. Khashoggi came from a totally different background: his grandfather made his family billionaires via the connections provided by his job – doctor to the king. Those billions helped future family members become prominent artists, journalists and intellectuals by purchasing gallery space, column space and bookshelf space. Jamal truly grew up among the political and cultural elite of Saudi life. Khashoggi graduated from (the hardly prestigious, given his wealth and connections) Indiana State University, and did not even get trained as a journalist but got a degree in business administration. It is being widely misreported, even by places like Al-Jazeera, that he studied journalism, but Indiana State doesn’t even have a journalism program (top-notch work there, guys – score one for PressTV). “Business administration” says a lot about his intellectual orientation and his plans as a young man (to manage his millions). Khashoggi: Accustomed to privileged treatment. But Khashoggi was so elite that he just had to ask to become king of the Saudi journalism sphere – he procured not one but two appointments to the newspaper Al Watan. After all, he had access to all the Saudis movers and shakers, was extremely close with Osama Bin Laden and was a high-level official at Saudi Arabia’s embassy in Washington for two years. All this explains why reading Khashoggi is to read a guy who essentially says, “What I’m writing here is going to be made into public policy” – and he means it and is right! For a journalist – who could ask for more? Contrarily, Ben Barka was hounded out of Morocco and nobody picked up on Shim’s reporting that UN World Food Organisation trucks headed for Syria were filled with people who looked and dressed like Takfiri terrorists. Despite his influence and responsibility, Khashoggi’s journalism did not attempt to voice the needs of the People of Saudi Arabia. In his journalism he admitted his social station divorced him from their common experience. What is far worse is that after such admissions he simply dropped the subject – he never questioned his privilege nor the system that maintained it. Even more so than a guy like The New York Times’ unbearable Thomas L. Friedman, who married into billions and is similarly influential in shaping policy discussions in the US, Khashoggi’s writing combines an aristocrat’s air of unquestionable authority with the certainty that the sun could never and should never set on his totally unmerited entitlements. Khashoggi is being portrayed as some sort of dissident, but it’s absolutely not the case: he spilled tankers of ink showing that he was 100% supportive of the Saudi (monarchical, and thus anti-democratic) system – the only question was “which monarch”? He ran afoul of the wrong one, but his proffered solution was only another monarch, and one who could have just as easily vivisected him in a Turkish embassy. Like all far-right proponents – not just monarchists – Khashoggi’s proffered solutions only suggested looking backward and deeper into his own tiny tribe – the 1% of Saudi Arabia. But Arabia is not all Saudi…and that is what Khashoggi’s journalism explicitly fought against – reflecting the democratic will of the Arabian Peninsula. The outrage in the West should be over their support for such an elitist, out-of-touch, anti-democratic reactionary…and yet HE is now the poster child for freedom of the press? No. We have Serena Shim – too many Serena Shims – for that. We will have more Serena Shims. I regret that even this series talks about Khashoggi and not Shim and Ben Barka from this point forward, because they certainly deserve it, and because the Mainstream Media never does that. They were the dissidents, the real reformers, the true martyrs. Jamal Khashoggi was not a victim but a willing, favoured participant in a system of exploitation and repression which he desperately wanted to uphold – read some Khashoggi and that will be clear. So why does the West support such a person? Khashoggi obviously represented something which The Post wanted to promote. That is hardly an epiphany, but Khashoggi gives us a chance to examine exactly what that was on an ideological level. Such understanding will grant us better understanding of Western policy and political culture; it also allows us to fully compare “Khashoggi-Thought” with the ideologies of previous decades and centuries, and also with other ideologies available and being promoted in 2018. Certainly, these intellectual currents are what are the most important to grasp when discussing Khashoggi. The media prefers to focus on that which is not relevant to our daily lives and struggles – the sensational and gruesome details of the killing, and the soap opera of the House of Saud’s latest, never-ending, internecine power struggles. It is very telling that there has been essentially no discussion of Khashoggi’s actual ideas, writings and morals. The unsaid implication in the West, then, is that he was “one of us” – i.e. he thought like a Westerner and supported Westernization. And he certainly bent over backwards to show them how much he wanted Saudi Arabia to exactly emulate the West. Khashoggi only wrote about 20 columns for The Washington Post and three of them were literally titled, “What Saudi Arabia could learn from…”, concluded by “Queen Elizabeth II”, “South Korea”, and even the Hollywood movie the “Black Panther”. A fourth carried the same message: “Why Saudi Arabia’s crown prince should visit Detroit”. Not only is that lazy and unoriginal headline writing, but it’s basically advertising (for Westernization) instead of journalism. In his work at Al-Arabiya (the Saudi answer to Al-Jazeera) which published his columns from 2012-16, the publication most often cited by Khashoggi seems to be The Economist, capitalist newsmagazine nonpareil. The West is mourning Khashoggi because they knew what they had: a Westerner in sheik’s clothing. But what did Jamal Khashoggi really believe, this journalist for whom we are spending so much time, energy and consideration, for whom column inches are devoted to instead of Shim and Ben Barka? Illuminating these great unsaids is the goal of this series, which analyzes and quotes from Khashoggi’s writings at The Washington Post and Al-Arabiya. Firstly, he despised Iran, by far the Muslim country which has most successfully rebelled against the West’s dictates, and was also an anti-Shia sectarian of the highest and most disgusting order. Secondly, he was the foremost promoter of what I accurately term “Liberal Democratic Salafism”. That’s an incredibly stupid ideology which combines 1%-focused West European/bourgeois democracy with (Islamic) monarchism, but that’s exactly what he promoted. For this he was hailed as a “reformer” because…the West is full of monarchy-loving, backwards-looking Liberal Democratic Salafists whose only difference is that their Salafism is of the Christian variety. Thirdly and lastly, “Liberal Democratic Salafism” combined with neoliberal capitalism is what made Khashoggi the prototypical fake-leftist of the monarchical Muslim World. Western 1%ers adored Khashoggi because the extremely limited and bourgeois changes he advocated would inevitably lead to mass privatization, thus giving Western high finance control over the single most powerful economic tool in the world today – Saudi oil. Handing over your country to such interests in the name of “reform” is obviously catastrophic, anti-socialist, unpatriotic, and fake-leftism. Why care about Khashoggi at all? It’s no revelation to find out that he was a reactionary tool of the West, but how many people appreciate that “reactionary” in the Western and Islamic Worlds are not worlds apart, but fundamentally identical? Clarifying what Khashoggi truly represented allows us to identify, call attention to, and fight against these reactionary forces, and also to appreciate the truly modern, cooperative, socialist-inspired world that Mehdi Ben Barka, Serena Shim and countless unheralded others have worked and died for. This is the 1st article in a 4-part series which examines Jamal Khashoggi’s ideology and how it relates to the Islamic World, Westernization and Socialism. Here is the list of articles slated to be published, and I hope you will find them useful in your leftist struggle! Khashoggi Part 2: A ‘reformer’…who was also a hysterical anti-Iran warmonger? RAMIN MAZAHERI, Senior Correspondent & Contributing Editor, Dispatch from Paris • Mazaheri is the chief correspondent in Paris for Press TV and has lived in France since 2009. He has been a daily newspaper reporter in the US, and has reported from Iran, Cuba, Egypt, Tunisia, South Korea and elsewhere. His work has appeared in various journals, magazines and websites, as well as on radio and television.